The mastermind behind this canine work of art is British artist Reuben Ward Binks. In his youth in the late 1800s, Binks showed artistic promise and verve, and won a competition at the tender age of 10 for his flower paintings. He found his calling, however, in canine portraits. The artist was soon painting Royal dogs left and right, from the Prince of Wales’ Cairn Terriers, to the Duke of York’s Labrador Retriever and even the Clumber Spaniels owned by King George V himself. 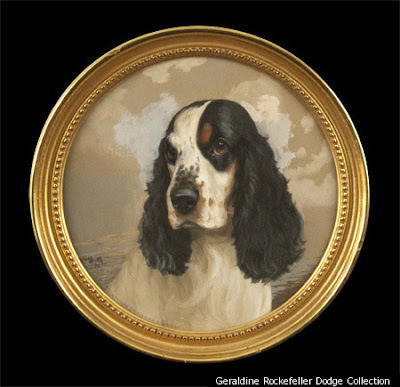 Geraldine Rockefeller Dodge, the alleged ‘favorite niece’ of J.D. Rockefeller, had a soft spot for pooches as a dog show judge and a breeder of championship canines with big dog shows just up the street from my cottage. Years later her estate auctioned off 150 of her pup-friendly works to help benefit the Saint Hubert’s Animal Welfare Center in Madison, NJ. I did not attend this auction but I know people who did. As expected, the best paintings stayed in the area and helped raise some serious money for this worthy dog rescue charity. Read more here. Mama Pea -- Yes. I agree. It's a beautiful painting. Very soulful. Appreciated the history of the artist and reading about the auction.